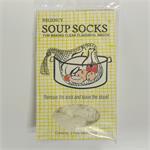 Serve soup in style. 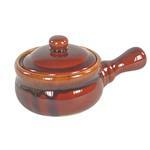 Ten ounce earthenware onion soup bowl with lid and handle keeps soup fresh and hot. Use with stews as well, serve from oven to table with ease. 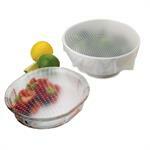 Professional gauge fine stainless-steel mesh basket works great for washing greens, vegetables, fruits, berries, and pasta. 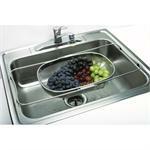 Expanding arms go from 14" to 22" to fit over sink - or place in the bottom of your sink. The wire frame provides stability. 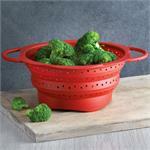 Quickly and efficiently scoop and drain foods straight from a pan or oven dish. No need to drain hot liquids from a heavy pan. 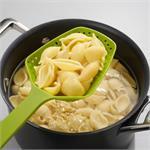 Made from heat-resistant, toughened nylon the scoop colanders will not scratch non-stick pans. The 10.5" diameter fits over most plates and bowls. 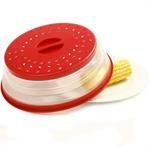 Pop it open when you want to use it and its full 3" height will cover a soup bowl or a plate piled high with leftovers. 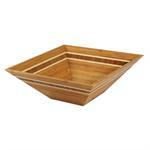 When collapsed it can be used to cover bowls and stores in only 1" of space. 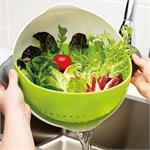 Inspired by nature, Silicone Bowl Covers by Charles Viancin fits on any smooth rim bowl or pot. 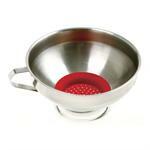 The vibrant red poppy will add a burst of colour to your kitchen. 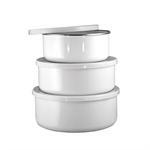 Freezer, oven, stovetop, microwave, and dishwasher safe. 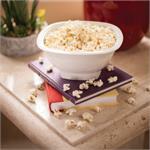 Inspired by nature, Silicone Bowl Covers by Charles Viancin fits on any smooth rim bowl or pot. Let the sunny yellow sunflower bring a bit of summer to your kitchen. Freezer, oven, stovetop, microwave, and dishwasher safe. 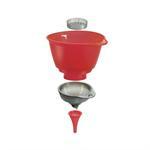 Sili-Stretch bowl covers are a budget and eco friendly way to seal in freshness. Each sheet stretches to twice its original size to fit many different sizes of containers and snaps back to its original shape when removed. 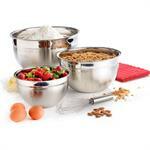 Church suppers, large batches for all your big needs or kneads, an oversized bowl is a must. 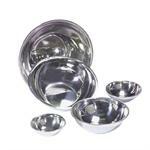 They are made of light weight stainless steel to make carrying them easier when full.